I hope that everyone in the East got through hurricane Irene safely, it sure was a crazy storm! We didn’t have much to deal with in the way of power outages and fallen trees as many people did but we spent most of Saturday and Sunday indoors just to be safe. For the Harbesons, weekends spent at home always involve at least one large breakfast. Like most Americans, I’m a sucker for a big breakfast or for brunch and I’m always searching for new breakfast ideas. On this particular morning I was in the mood for protein and thought eggs and bacon sounded good but I didn’t want the same old scrambled or fried eggs. I remember seeing a whole chapter in Julia Child’s cookbook on eggs and immediately turned to Julia for inspiration. In the end I took her baked egg recipe and made it my own by adding a few tasty ingredients. Baked eggs are very simple and are cooked in ramkins; there is something extra special about individual size ramkins, they immediately make the meal seem more formal. This recipe requires only a few ingredients: eggs, cream, butter, thyme and cheese. Start by boiling water, you’ll need this for cooking the eggs. While waiting for the water to boil, chop up the fresh thyme or your favorite herb and shred the cheese. Butter inside each ramkin, well and sprinkle the bottom of the ramkin with half of the thyme, half of the cheese and a little salt and pepper. Pour 1 tablespoon of cream into each ramkin. Once the water is simmering, pour it half way up the sides of the ramkin. In order to preserve the delicate nature of the egg so that it does not get rubbery in consistency, baked eggs are cooked in a waterbath much like a custard. This means that boiling water is poured into an outer pan until it reaches half way up the ramkin. Use a stove top safe dish to cook the ramkins because you will need to simmer the water around the ramkins until the cream is hot. Once the cream is hot, crack one or two eggs in each ramkin and top with another tablespoon of cream and a dot of butter. Bake for 7-10 minutes until the top is setting on the edges but still runny in the center. Serve with a side of bacon and some toast or an english muffin for dipping. I loved my first baked eggs! I must admit I cooked mine a little too long, next time I’ll take them out about 3 minutes earlier but even with the egg more cooked the blend of thyme and cheese was delicious and light. The whole meal took me about 30 minutes or less to make and with the ramkins made me feel so formal; easy and elegant, win, win. Here’s the recipe and please feel free to use your favorite choice of cheese and herbs, make it your own! Heat water to boiling. Preheat oven to 375 degrees. Butter ramkins and sprinkle with 1 teaspoon thyme and 1/4 cup of cheese, salt and pepper to taste. Add one tablespoon heavy cream to each ramkin. Pour boiling water into baking dish until it reaches half way up the outside of the ramkin. Simmer the water until the cream in the ramkin is hot. Add 1-2 eggs to each ramkin, top with 1 tablespoon of cream and a dot of butter. Bake at 375 degrees for 7-10 minutes until the outer edges are firm and the middle is still runny. We brought the wine over to dinner with friends that evening and while the men drank beer the ladies opened Red Velvet. The first sip was a little lackluster, I must admit. I prefer bolder wines with a lot of flavor and depth, like a nice Italian wine but Red Velvet was lighter and less complex. Then I began to take another sip and another and it grew on me. In the end, I enjoyed the lightness of the wine and felt it paired well with our pork bbq dinner. Eric was less “in” to the wine than I was, he tends to be a little more snobby when it comes to wine, but I plan on purchasing some Red Velvet again in the future. So there you have it my friends, Red Velvet wine does exist and I say, try it! After all it is wine and I never met a wine I didn’t like. Anyone else tried a wine based purely on its label and name and actually enjoyed it? OR worse, hated it?? We did have an adventure with Bulls Blood wine once, but I’ll leave that for another day. Happy Friday everyone! First, thanks to Eric for a great Guinness post, gotta love his tribute to the velvety red stuff and I loved that he took on that post so I could take the extra time to relax. In sticking with the alcohol theme for this week, which just happened, it was not planned, I made one of my favorite and truly a Marah original pasta dish. I may have mentioned my love for S. Clyde Weaver before but I’ll say it again, I love that place! If you live in Lancaster or even close to Lancaster, chances are you know S. Clyde Weaver, they make the best meats and cheeses in the world plus that have delicious sandwiches made to order. The best product that I think they offer, is their sausage; I have never tried an S. Clyde Weaver sausage I didn’t like. I am lucky enough to live very close to S. Clyde Weaver’s large retail store and cafe and I frequent Lancaster Central Market, which has an S. Clyde Weaver stand in it as well. After a few monts of trying their cheeses, smoked bacon, maple apple sausage (YUM) and their German style bratwurst (read about that here), I began to notice a sausage that lived next to the bratwurst, the sundried tomato and basil sausage. Eric gave me the push I needed one morning at market and we fell in love with it. Naturally after discovering it I began searching for new ways to use it and after alot of research came up with my own recipe. I’ve always enjoyed vodka sauce with penne, it’s typically paired with grilled chicken but I thought it would be a great compliment to the sundried tomato basil sausage and boy was I right! I also added fresh mushrooms and basil from the garden and the dish is now one of my absolute favorites. Fill a pot with water and boil, cook your favorite pasta shape; penne or rigatoni are recommended. Meanwhile saute the onions and red pepper flakes until the onions are translucent and then throw in the garlic for a minute or two. Toss in fresh sliced mushrooms and saute until they’re brown. Add in the sliced sausage and saute until there is no more pink left on the sausage pieces. Pour in a jar of your favorite canned marinara sauce or 2 cups of homeade marinara (I used jarred). Add the vodka and mix well. Simmer the sauce over medium heat until it has reduced by half, about 10 minutes. Pour in the heavy cream and cook until the sauce thickens. Add in the cooked pasta (drained well) and salt pepper and parmesan to taste. Top with some extra basil and parmesan and enjoy! This receip makes enough to feed about 6 people. I like it because it makes us lunches for an entire week or can feed a few friends. Pair the dish with a bold Italian wine and you’ve got a comforting pasta meal fit for a king! The sausage is incredible in this dish but if you don’t eat pork, look for a turkey sausage with the same sundried tomato and basil combination it would work just a well. Bring a medium saucepan of salted water to a boil. Add the pasta and cook until just al dente, 10-12 minutes. Drain in a colander and return to the saucepan. Meanwhile, in a large skillet, heat the olive oil over medium heat. Add the onions, salt, and red pepper flakes and cook, stirring, until the onions are soft and golden, about 5 minutes. Add the garlic and cook until fragrant, about 30 seconds. Add the mushrooms and cook until brown. Add the sausage and cook, stirring, until browned and all pink has disappeared, 3 to 4 minutes. Add the marinara sauce and cook, stirring, until thick, about 2 minutes. Add the vodka and cook until the sauce reduced by half, 10 minutes. Stir in the cream and cook until the sauce thickens, about 2 minutes. Stir in the basil and remove from the heat. Toss the sauce with the pasta to coat evenly and transfer to a pasta bowl for serving. Top with cheese and sprig of basil and serve immediately. Could there be such a thing as red velvet beer? Well yes there certainly could be, but we’re not that big yet, so we’ll settle for the next best thing. One of my favorite beers, and definitely an old stand-by is the perfect Guinness Draught. Now you might be wondering why Guinness as the first foray into the brewing arts by Red Velvet blog? Quite simply, it is because of it’s red… yes deep ruby red color, and it’s velvety smooth taste. I am not an expert on Guinness, but I do know how to expertly enjoy it! For me, it all starts, and many times ends, with the perfect pour. If not done correctly, an improper pour will effect my enjoyment of the beverage, which is unacceptable for the first Guinness of the evening (three or four in I may not mind as much). The first part of the pour is selecting the classic tulip shaped glass (which was actually recently redesigned in 2010). The glass should be held at a 45 degree angle and the draught should be poured to fill as much as possible at this angle or approximately 3/4 full. Next the pint should be set asside until the first pour settles, and the color is uniform. After the appropriate amount of time (after all, good things come to those who wait) the pint should be filled the rest of the way with a second pour. According to the official marketing, the whole process of a perfect pour should take 119.53 seconds. Then it is simply time to enjoy. I like to let the dark roasted barley stout coat my throat as I enjoy the first sip, and it is always fun to wipe away that first Guinness mustache. Not like other stouts, Guinness has a distinct flavor and smoothness, and Marah will be the first to tell you Guinness is not for everyone. While she rarely will have a Guinness here in the US, she will also tell you that (as is true with most things) it is much better when you go straight to the source. All Guinness in the US comes from the St. James Gate Brewery in Dublin, which just recently celebrated their 250th year in a 9000 year lease of the downtown Dublin location. We were lucky enough to visit the emerald isle, and apart from checking into the hotel, the Guinness tour was our first stop (and within walking distance) after the overnight flight. The building where the tour takes place is a phenomenal old storehouse which was used for fermentation until 1988 and is filled with all of the old machines and brewing tools. However, the best part of the tour is the 360 degree view over the city that awaits you at the end of the tour in the Gravity bar as you enjoy a complementary pint. Everytime I have a Guinness I am amazed at how unlike other stouts it really is. I’m not going to say it is the best stout in the world, but it is certainly unique, and I think you have to respect that. It almost seems as if there is some kind of Irish magic in it. Guinness has the amazing power of giving even the gloomiest days a happy ending. I find it’s best enjoyed on a rainy day, no warmer than 50 degrees alongside a nice hot Guinness stew, or shepherds pie (maybe I’ll get Marah to make that for an upcoming post?). For some reason, it is always better if nothing has gone right for you yet on that particular day. At that point, there is nothing better than a Guinness. Every pint of Guinness seems to have a story and a couple of my personal stories were in Dublin. I’m not sure if it’s because I was tired and cranky after the overnight flight, or because I was pissed off that part of my luggage was stolen, but I will always remember the 1 and 1/2 pints (Marah didn’t finish hers) of Guinness at the Gravity bar as quite possibly the best pints I’ve had. They certainly were the freshest. Although, our last night in Dublin wasn’t too far off either. At the reccomendation of my cousin, we popped in to O’donoghue’s pub for a pint and some live music and were treated to the whole bar spontaneously breaking out in Irish drinking songs as if we were in a movie scene. It was a wonderful last night in Ireland, and Marah and I both are longing to go back. The last thing I will say about Guinness is that it really is good for you. Very similar to a glass of wine, Guinness has been shown in University studies to have the same antioxidant powers as many common fruits and vegatables. So drink up, Guinness is Good for You! Do you find yourself throwing away food on a weekly basis like I do? I always have good intentions but then the week gets busy and obligations come up over dinner time and I end up not making a few vegetables that I have purchased or I throw away leftovers that could have been eaten but have already passed on to spoiledville. I find it incredibly frustrating. If you don’t find yourself doing this and you actually use everything you purchase then please come teach me your ways; when it comes to using all the food I buy, I’m failing. Over the years, I have gotten better at determining how much food we eat each week and I have become better about putting meat that I think I’m not going to use right away into the freezer but now I have the problem of fruits and veggies that are going way past their prime in my fridge or on my counters. And let’s talk freezer for a moment, shall we? I put meat in the freezer if there is a buy one get one sale at the grocery store or if I bought it for a planned meal and then after a few days didn’t end up making it. I put it in the freezer and forget about it. Then 6 months to a year later I get out a giant trash bag, fill it with freezer meat and trash it. Last year, I got a free turkey from the grocery store for purchasing a certain amount of food during the month of November, kept it in the freezer for 12 months and threw it away!! I know, knife through the heart. As food prices climb and all of our grocery bills are getting higher, I’m making an August resolution. I will use everything I possibly can and if I’m not using it, i’ll stop buying so much. This may mean a shift to only purchasing fresh veggies for 3 nights of dinner and buying some frozen that will last longer. I also need to commit to making “freezer meals” about every 6-8 weeks to clear out what has accumulated but hasn’t gone bad. It’s a dis-service only to myself to commit to clipping coupons each week and then throw out hundreds of dollars in food each year! So here it is in writing, my new commitment to you all to buy smarter and waste not in my kitchen. Who’s got a few suggestions to help me do that better?? Last week, I attempted a dish that has been dog eared in my June Bon Appetit since, well June. As mentioned in my many cherry posts, Eric and I will eat anything that involves cherries and as soon as I read this recipe I wanted to try it. 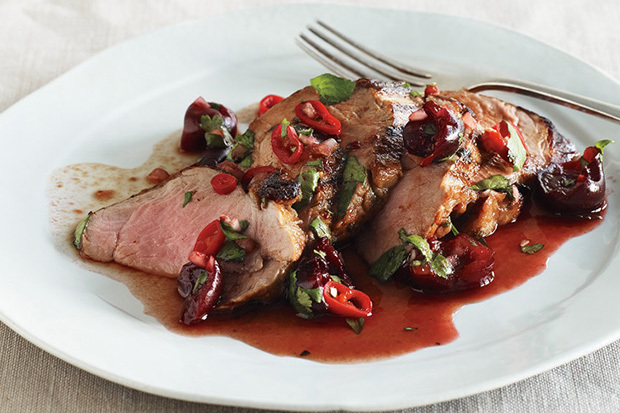 I liked that the recipe used cherries but I also liked that the pork was grilled and that the whole meal was relatively simple and quick to prepare. This recipe will take you 2 days to make because the meat needs to marinate overnight and the salsa can be assembled the night before. I started by chopping up all the ingredients for the pork marinade and threw them in a plastic bag with the pork tenderloins. Sidenote: Pork tenderloin may be my favorite meat to eat/prepare; it feeds a lot of people and can be seasoned in endless ways. It also looks beautiful on the plate. It is often my “company” meal. Once you get the pork marinating chop all the ingredients for the salsa; cherries, chili pepper, cilantro, lime and olive oil. Here is where I made an epic mistake. The recipe simply calls for “fresh cherries” which I interpreted as tart cherries. I always use tart cherries for desserts so why would this recipe be any different? Everything I read about the recipe never specified sweet or tart cherries, it just kept saying cherries. I hope you will all learn from my mistake, when a recipe calls for cherries, it means sweet ones. Lesson learned. Still unaware of my mistake I mixed together all the ingredients for my salsa and stuck it in the fridge, covered, overnight so the fresh flavors would get married. The following day Eric grilled up the pork while I made the side dish, zucchini pancakes. The pork truly looked gorgeous after being grilled, much better than when I bake it in the oven. At this point I had tasted the cherry salsa and it was pretty bad. The thought then occurred to me that perhaps the recipe called for sweet cherries, especially considering the fact that I know pork pairs well with sweet flavors (cranberries, blueberries, etc.). I was upset with my mistake but tried to remedy it by adding a tablespoon of honey to the salsa. It wasn’t a bad move, the flavor improved a bit and we were able to eat it, the pork tasted delicious however the tart cherries definitely ruined the meal. The salsa was beautiful and the plate was very appetizing. I will be trying this again, with the correct cherries. Prepare a grill to medium-high heat. Combine 1/2 cup cilantro, 1/4 cup minced shallots, 4 tablespoons lime juice, and vegetable oil in a resealable plastic bag. Add pork; seal bag and turn to coat. Marinate at room temperature for 15 minutes, turning occasionally. Meanwhile, combine remaining 1/2 cup cilantro, 1/4 cup shallots, 2 tablespoons lime juice, cherries, chile, and olive oil in a medium bowl. Season salsa lightly with salt and pepper and set aside to let flavors to meld. Remove tenderloins from marinade and season generously with salt and pepper. Grill tenderloins, turning frequently, until a thermometer inserted into meat registers 145°F, about 15 minutes. Let rest 10 minutes. Cut into thin slices and serve with salsa. As promised, way too long ago, I’m finally getting around to a post on our night of crepes. Crepes, in the off chance that you haven’t had the pleasure of eating them before, are French and look and feel like a tortilla but taste more similar to a pancake. They can be created in endless flavor possibilities both savory for a meal and sweet for dessert. I like to eat them when ever and where ever I possibly can. I fell in love with crepes at the young age of 10. My awesome French teacher would actually bring in all the ingredients and allow us to make crepes in class one day each year. This was everyone’s favorite day and I took home a copy of the recipe and began making them at home for my family. Then, I went to Paris, in college, and fell in love all over again. There is something about an authentic French crepe made right before you on a the street that just makes it taste out of this world. I’ve never been able to replicate the crepes I’ve eaten in France but I do enjoy getting as close as I can to those epic crepes in my own kitchen. One thing to make note of before making crepes is that while the batter is very simple to make, it must be refrigerated for at least 2 hours, if not overnight before you make the crepes. I prefere to refrigerate overnight because that makes the meal even faster to whip up. For this particular crepe evening, I choose a new recipe from Julie Child an made 2 separate batters; one for savory crepes and one for sweet. Both were made in the blender and mixed up in about 15 minutes or less. Chill both overnight. Crepes can be made on an official crepe pan or simply on a large non-stick fry pan. Since marrying Eric, we bought an official Le Creuset crepe pan and I must admit to you all that I’m terrible at making the crepes in this pan. I was decent at it in the frying pan but for whatever reason I can’t make it happen in this pan. Crepes are Eric’s territory and I’m happy to give up that job, he’s really good at it and I am in charge of filling the crepes with delcious insides. I choose two savory crepes to make, mushroom and ham and cheese. The mushroom filling is very simple. Saute one diced onion in butter until soft. Saute the mushrooms until they’re soft and have released their juices. Add 1 teaspoon of chopped fresh rosemary and salt and pepper to taste. Spinkle with 1/4 cup of parmesan cheese, save the rest for when you put the crepe together. The mushroom filling is complete. The ham and cheese crepe is exactly what you think it is. I buy ham from the deli, thinly sliced and place it inside the crepe with sharp cheddar cheese, grated. Nothing like easy and delicious. Now for the tricky part, making the crepes. Warm your pan on med-low heat until hot. Brush the pan lightly with butter, remember to do this before each crepe you make. The recipes say to use 1/4 of a cup of batter, this was not working well for us so Eric upped it to 1/2 a cup. I guess we just couldn’t get them thin enough but they were still delicious. As soon as your batter is on the pan, begin gently lifing the endges of the crepe with a long spatula, it will cook extremely quickly. One you’ve gotten the whole way around carefully flip the crepe. Use your first 2-3 crepes as practice, don’t plan on being a pro with the first one, it take a while to get the hang of it; I mean I can’t even do it at all…But I’m sure you will be able to! Eric made a little purse. Cook the crepes: Heat a 5- to 8-inch crepe pan or nonstick skillet over medium-high until drops of water dropped onto it dance. Brush the pan lightly with the additional melted butter. Pour in 2 to 3 tablespoons of batter and tilt the pan in all directions to cover the bottom evenly. Cook for about 1 minute, or until browned on the bottom. Turn and cook briefly on the other side. Cool the crepes: Cool the finished crepe on a rack while repeating the process with remaining batter. Presentation: When cooled, crepes can be stacked and either filled and served, or refrigerated (well covered) for 2 days — or frozen for several weeks. Either whirl all ingredients at top speed in an electric blender for about 1 minute; or gradual work the liquids into the flour with an electric mixer or wooden spoon, beat in the dry ingredients, and strain through a fine sieve. Refrigerate for at least 2 hours, allowing flour particles to swell and soften. Growing up, my mother would make zucchini pancakes about once a year. As a child, when I would hear that we were having zucchini pancakes for dinner I recall making a face and thinking to myself “just because you put it in a pancake, doesn’t make me want to eat it, you can’t fool me, Mom!” But dinner would roll around and I always found myself enjoying the zucchini pancakes more than originally expected. I think there is just some thing about the name zucchini and pancakes shouldn’t mix but they do! And they are really good. Recently while shopping for vegetables, I bought some zucchini because it looked great and planned to simply grill it up as a side. As I was unpacking at home, my memories of zucchini pancakes came flooding back to me and I decided I needed to make them this week. The pancakes are very simple to make and have a nice savory flavor to them. I’ve seen recipes that mix the zucchini with potato and recipes that make mini zucchini pancakes and top them with smoked salmon and cream. I like to make larger ones that are served as a side dish with a meat entree. In this case, I served them with pork tenderloin. To start the pancakes, the zucchini must be shredded. The recipe calls for you to use a box grater which works great but I opted to go with the quick and easy method of grating with my food processor. To each his own. The recipe also calls for grated onion, again easiest in the food processor; 1/2 a small onion will get you about 2 tablespoons of grated onion. Once the onion and zucchini are grated, mix them together well in a bowl and add the 2 eggs lightly beaten. Mix well and then add 6 tablespoons of flour, salt, pepper, and baking powder. Mix well. Heat up your fry pan immediately. If you let the batter sit very long before making the pancakes, the zucchini will release water and make the batter thin and watery. Its better to make the pancakes and keep them warm in the oven than to let the batter sit and make them fresh. Melt some butter and oil in the pan and fry the pancakes over medium heat until they are golden on each side, about 2-4 minutes per side. Some enjoy their pancakes served with apple sauce, I prefer to eat a bit of pancake with a bite of meat. I would not, however, recommend maple syrup no matter how much your children beg. This recipe is a delicious and different way to use zucchini and especially if you have grown some in your garden and don’t know what to do with all of it! Last Summer, Eric and I were fortunate enough to get the chance to go on a fabulous trip for two weeks to Germany and Southern France, more specifically Provence. We have dear friends that live in Germany, whom we met the last time we vacationed there and were able to visit with them before driving South to the warm and sunny Cote d’Azur (aqua coast in English because of the beautiful water). Eric and I fell in love with Provence, as most people who visit it do. The food was fantastic and the seafood, incredible. The weather was hot but the water was cool and the smell of lavender always seems to permeate the air. Provence is slower than a city like Paris, people take their time and life revolves around eating, staying cool and time with family and friends. This is a way of life that Eric and I dream of joining someday (currently we’re hoping to retire there, but if life takes us there before that we wouldn’t mind!). It also doesn’t hurt that the average French inhabitant, actually European inhabitant gets a minimum of about 6 weeks vacation every year. Yes, Americans work way too hard and our vacation/sick/maternity policies are the worst in the world. Google it if you don’t believe me and then email you findings to your boss. This is part 1 of 3 of the show and you can see the rest on YouTube. The official wine choice of Provence is Rosé and after visiting, our official Summer wine choice has also become Rosé. Rosé is not to be confused with a blush wine like a Zinfandel although the two varieties share a smiliar coloring, they are completely different in taste. In my opinion, a Zinfandel is way too sweet. Which is often the reason women tend to like this wine better than men, the same goes for white wines. A Rosé is crisp and clean and dryer than a Zinfandel. Perfectly refreshing for a muggy Summer day. It pairs well with anything from the grill and any seafood choice. Rosé must be enjoyed chilled to enhance its flavor and refreshing qualities. Most regions in Southern France have a local rosé that is inexpensive and delicious. Here in the USA, I have had a tough time finding more than 2 choices of rosé at the liquor store. Perhaps, the reason is that it’s not popular locally or it has something to do with the archaic liquor laws in Pennsylvania or I haven’t visited all the local liquor stores to really know what they’re offering but suffice it to say, I’d love to see more than 2 kinds of rosé when choosing my wine. My challenge to all of you is to try it. Whether you prefer white wine or red or aren’t even a big wine drinker, I think rosé might change your mind. So get out to the liquor store and buy a bottle for the weekend, don’t forget to put it straight into the fridge so it’s nice a cold when you decide its time for a glass. Tonight we’re drinking our rosé with crépes. Don’t worry, crépe post to follow! I’m sure you’re wondering where I’ve been, the truth is I haven’t been cooking much in the last week so I actually ran out of new things to write about! Last week was our 5 year wedding anniversary and we ended up celebrating by going out to dinner several days in a row; that is the best celebration for us, good food. Thursday was the actual day and I was planning the evening’s activities. We were married in a park located in York, PA, where I grew up, and we hadn’t been back to that spot since we were married. I thought it only fitting that we go back and reminisce. Of course we drove through an insane thunderstorm on the way there and I was afraid we would have to forego the park but things calmed down and we were still able to get out of the car. The place looked just the same and it was great to see it again. Next on the agenda was dinner. When Eric and I were dating, we loved a French restaurant in York. The owner was from France and a really fun guy not to mention the food was outstanding. A few years ago he sold that restaurant and we were very sad, but to our delight he opened a new place that is much smaller but still has the same great food. I thought it would be the perfect place to go. When you pull up to The Blue Heron you don’t even realize what a great restaurant is on the inside. I’m not sure what the building used to be but Eric said it looked more like a real estate office and I think it looks like a drug store. Inside the dining room is only one room and very intimate seating only 34 people at a time. David, the owner and head chef, seated us and served us and there was one waiter for the whole place. There is no bar but you can BYOB so we brought along a bottle of rosé. The best thing about BYOB is that you save money on the dinner bill; I can’t complain about that! The broth at the bottom of the bowl was garlicky and creamy and I dipped about 4 slices if bread into it because it tasted so good. Following the meals we spent about 10 minutes in silence except for the occasional yum, mmm and mmhmm noises. The meat was cooked perfectly and the sauces were the perfect representation of French food. I purposely didn’t finish my meal because I knew dessert would be good and after bringing out a dessert tray to tempt us, I choose a chocolate royale; a cripsy wafer topped with chocolate mouse and encased in a ribbon of dark chocolate ganache and topped with whipped cream and raspberries. I forgot about taking a photo until half way through dessert so here’s a photo of half of it. Delicious doesn’t even do it justice. Needless to say, I finished all of my dessert, quickly. I’d highly recommend The Blue Heron to anyone, we had a wonderful evening and can’t wait to go back and try new things from the menu.